Week 4 is here, week 4 is HERE! I can see the light at the end of the tunnel. Once this week is over I have 3 days of Whole30 next week, and then I'm going to eat a giant bowl of pasta, or a pizza, or both. I've tried to be as transparent and honest as I can be about my slip-ups along the way. Which, by the Whole 30 regulations, classifies me as a complete failure. I'm trying not to get bogged down by that, because I still view this challenge as a personal success. I've lost a few pounds, I'm drinking much less, and I'm trying new foods and recipes. My skin has cleared up, I'm sleeping better, and have a lot more energy. I now know what foods jive with my body, and what foods my stomach just can't handle. After a few splurges next week to satiate some of the cravings that just won't go away, I plan to return to the Whole 30 plan following the 80/20 rule. In moderation, it's a great lifestyle that promotes eating more veggies, less processed foods, and less of those empty carbs that we all have a love/hate relationship with. 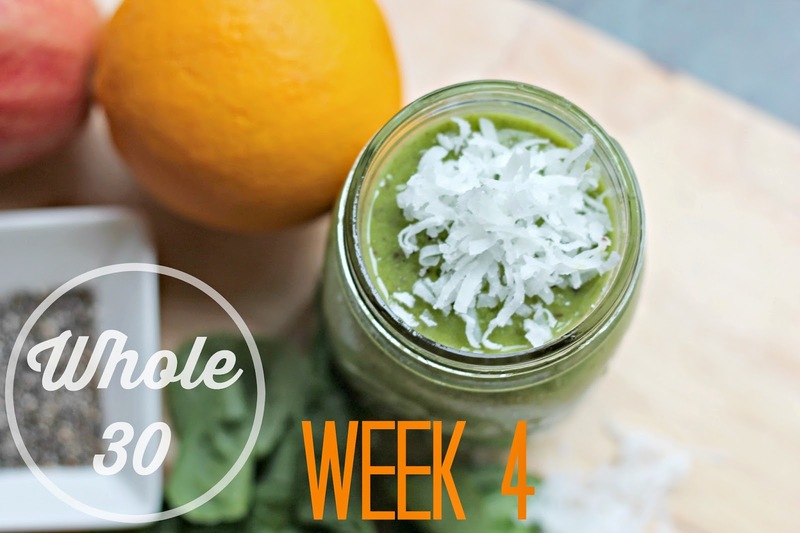 B- Green smoothie with spinach, coconut milk, frozen peaches, grapes, and apples- I'm using this helpful guide that I found on Pinterest for my smoothies this week. I did a W30 in January and loved it! But I have tried to get into it again, and just can't. It is so mental, but still...congrats on week 4!